We had a horrible tragedy in my hometown of Prescott, AZ. On June 30, 2013, 19 of our “Hotshot” firefighters perished in a fire down the hill from Prescott in Yarnell. Seems everyone knew at least one of the young men who died that day. It was awful. You just feel so helpless and empty and sad. I knew Andrew Ashcraft and his wife Juliann from church. I had their kids in our church nursery and oftentimes, they came in to help with the kids. I always liked Juliann. She reminded me of me when I was her age. A bit of a rebel, but LOVES her kids, as did Andrew. To this! Yeah, it looks little here because this is a computer screen, but this is probably the largest in square footage mural I’ve done. The image is sort of okay. It’s the best one of any that anyone took of the whole thing at once. 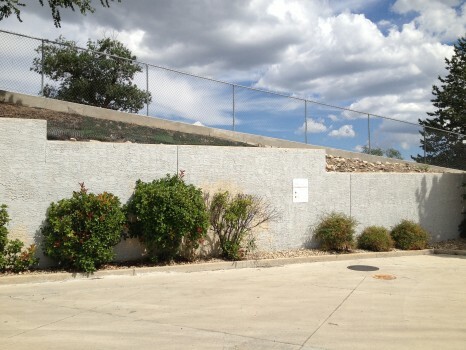 (This was done by Brian and Melanie Thiesse taking 2 panoramic shots while driving their car by it). Keep reading and I will break it down into small parts/stories and give you better images of each. 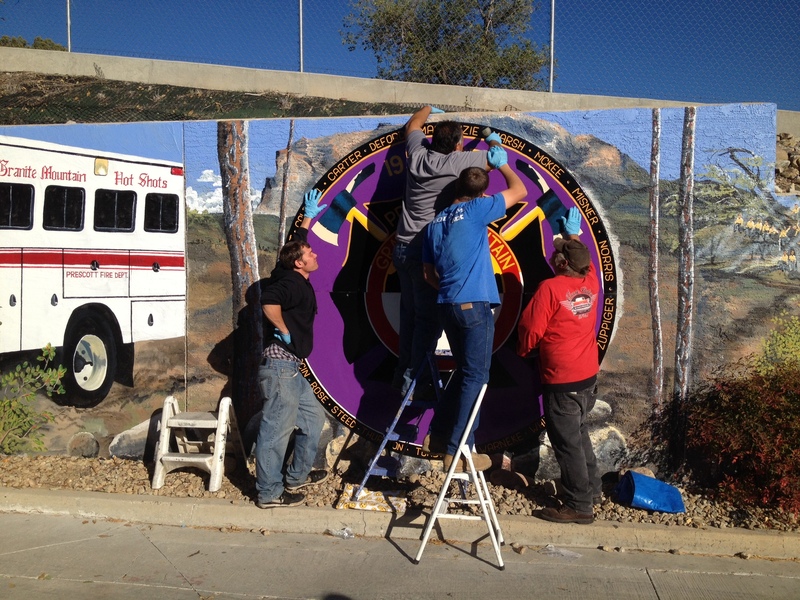 While they were going through all the whatever of approving it, I got busy on an extra part, some rocks and trees, plus the 8′ circle where the Hotshot “last alarm” symbol would go and Granite Mountain, their namesake. Once the approval came through, Roy and Lenora had decided they would restucco the wall. They had it done with this special stuff that can be painted on the next day. Once they were done stuccoing I was able to get right to work. 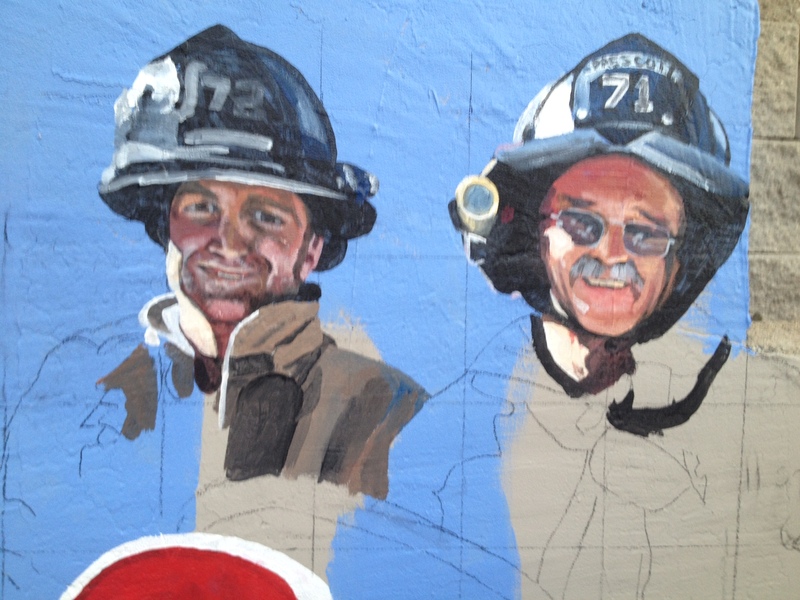 In trying to figure out how to lay this blog out, since my mode of painting is “paint on this till I’m tired of it or the sun goes away, then go paint on that”, really the only way to tell you how this mural was done is to start on one end of the 120′ mural and work my way to the other, with the “sweet distractions” parts scattered here and there. As I mentioned before, I’d painted a big pile of rocks on the far right of the mural. 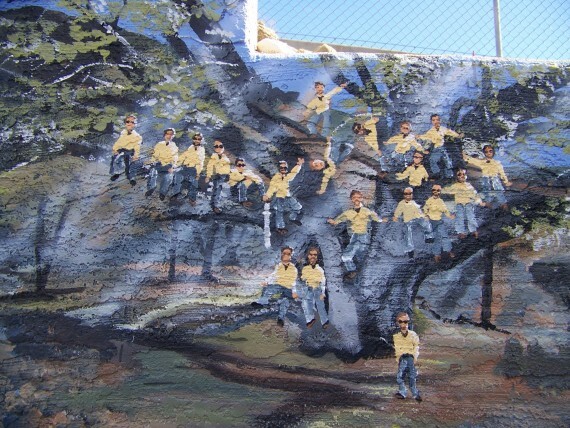 At the time, they were just rocks so the end of the mural wouldn’t look weird. But then as time went on and ideas were borne, some really cool things happened with those rocks. 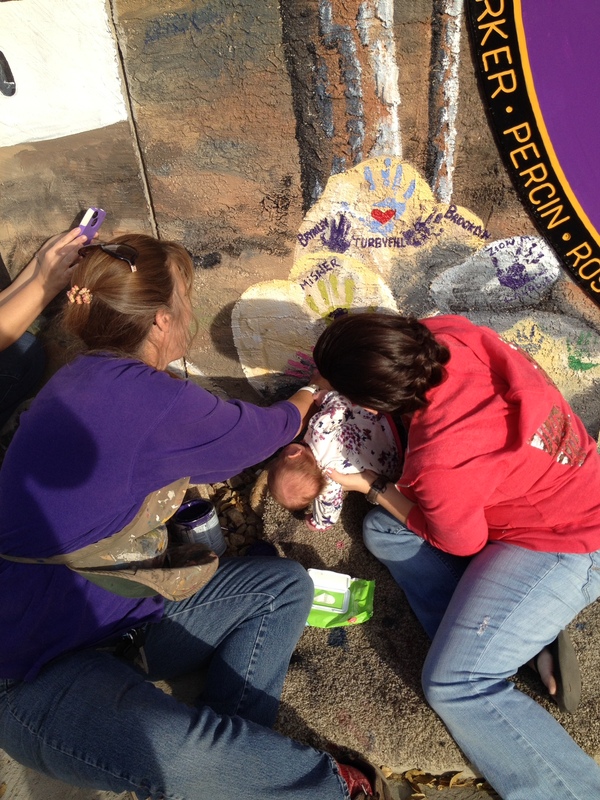 The first was that I started letting children and some adults put their handprints on the rocks. 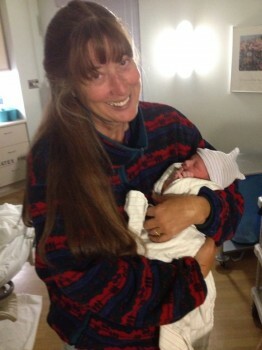 Grandkids of the owners and my grandkids (0f course, like this cute little one of Avaleigh! 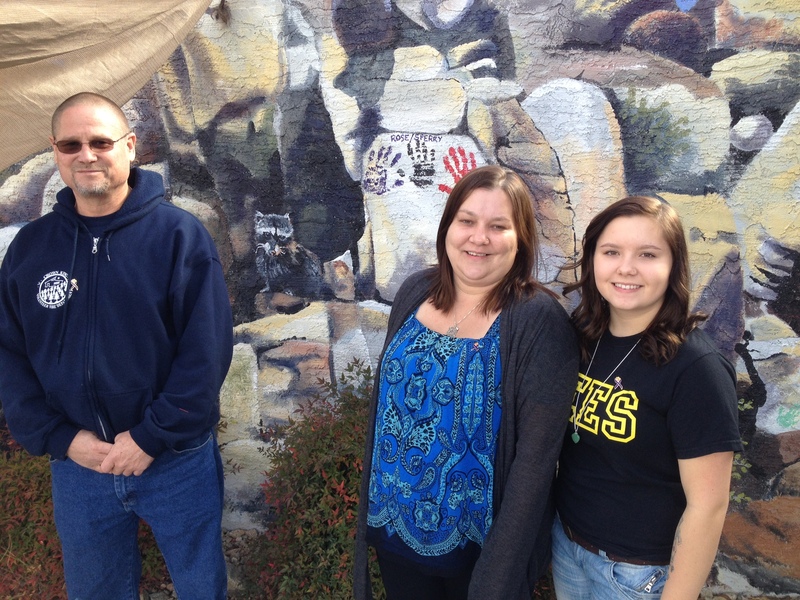 ), families and friends of the people in the mural and others with an interest in the mural and it’s subject. 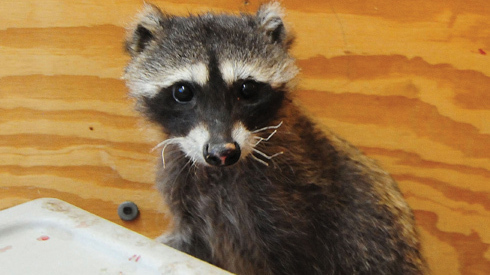 Next, about a month after the Yarnell fire, a little raccoon was found with his paws badly burned, his ears burned mostly off, his nose and whiskers burned and other burns on him. Alive but of course hurting. Seems he should have died, but he didn’t! He’s now at Prescott’s Heritage park Zoo after being fixed up by vets here. In those rocks I’d painted, I put in 2 “caves”. 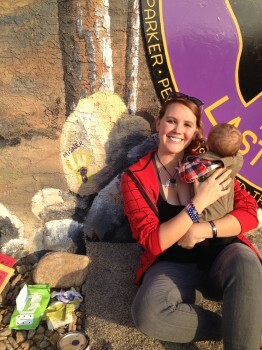 Where better to put the little raccoon, now named “Hotshot” than peeking out of one of the caves! Just before the Yarnell Fire where the Hotshots perished, was the Doce Pit Fire, right here in Prescott on their namesake, Granite Mountain (I was evacuated for that fire!). 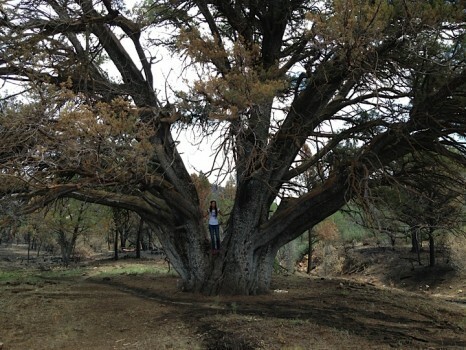 One of the things they saved in that fire, besides homes, was arguably the largest aligator juniper tree in the world. There are 2 here in Yavapai County and there is debate over which is the largest. 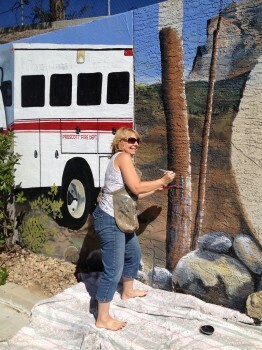 I was going to put this tree, or at least the base of it in the middle of the mural but as I found out, it’s WAY too big! Here is a pic of Andrew Ashcraft’s widow, Juliann standing in the tree just so you can get an idea of how big it is! So I came up with another, I believe much better idea. Between the rocks and the next part which is the Last Call Emblem, I painted a trail which lead up to this tree in the distance. I did some research on the “Tree of Life”. I decided I wanted to turn this tree into one. The Hotshots saved this 1,000 year old tree, preserving it’s life. Seemed appropriate. So I painted it, then put beams of light across it to give it that heavenly glow then, put the 19 hotshots who had perished up playing in the tree and the 1 hothsot who survived, standing on the ground beneath the tree. The only one left on this earth. This was hard for me to paint, yet also easy, as it just seemed to paint itself. I got a little dewey eyed as I painted. As mentioned, the “Last Call” emblem came next. This thing is meant to LAST. It is made of signboard, a marine grade wood meant to hold up to the elements and One Shot lettering enamel, a very strong, durable oil based paint. A&B Signs was kind enough to donate the board along with their expertise/advice and The Art Store here in Prescott donated the enamel. I love you guys! My brother Bill first cut the wood in a circle and routed the edges. I marked in the names of the fallen around the circle, then Bill carved the names out. He did a BEAUTIFUL job. Thanks Bro! 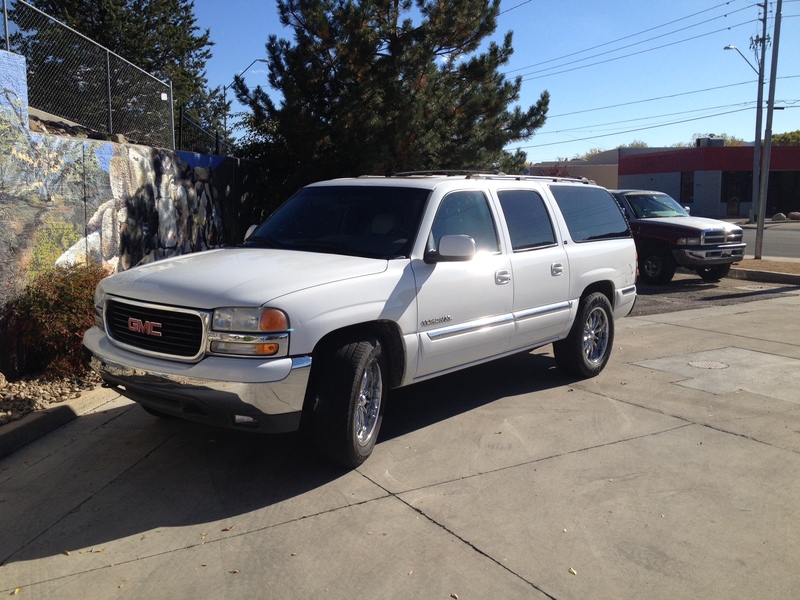 Of course he was 3 weeks early, so I took the very large Last Call emblem, in my other distraction, my new Yukon …aka the “ladytruck” aka “Large Barge”. Perfect for hauling scaffold, wood and grandbabies… up to the Grand Canyon Village where my Son and Daughter in law live, set it up in the Rec center there and worked on it when I wasn’t slobbering over my new little grandson Oliver and his big sis Avaleigh or polishing my new wheels! 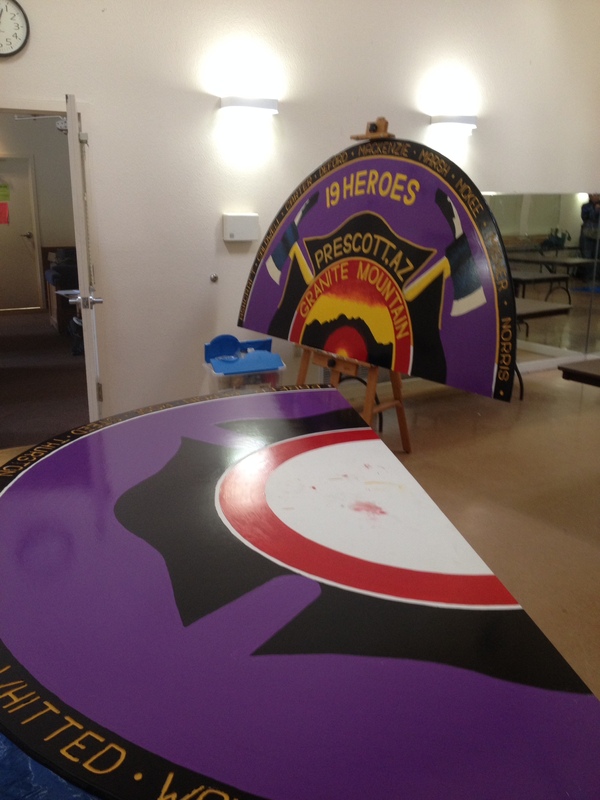 This Last Call emblem was installed by Brad and Gary and their cohorts. It’s stuck on with mastic, and many many giant bolts which are disguised in the dots between the names and in the center. That sucker is going nowhere! 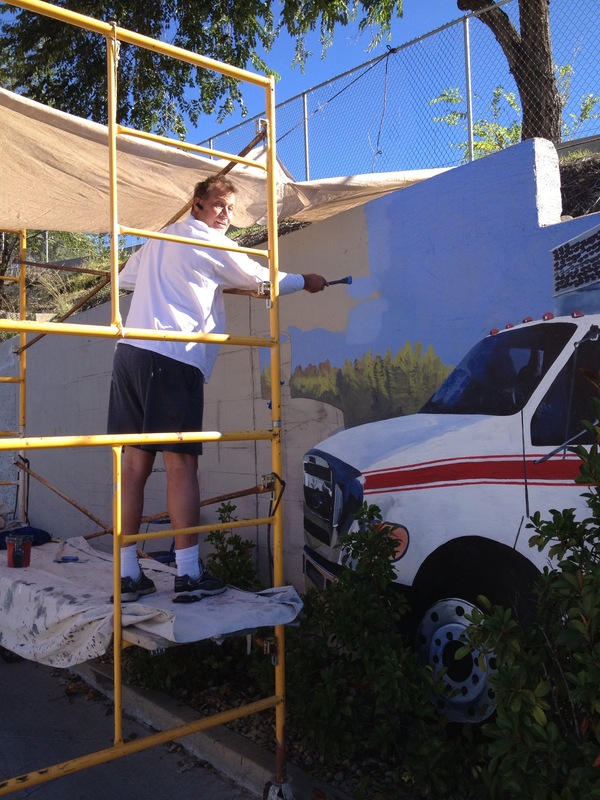 At this point, I was ready to paint the rest of the mural, but was waiting on the stucco guys from Pruzina and Pierce Stucco who volunteered their stuccoing expertise. When they were done, it was an awesome surface! 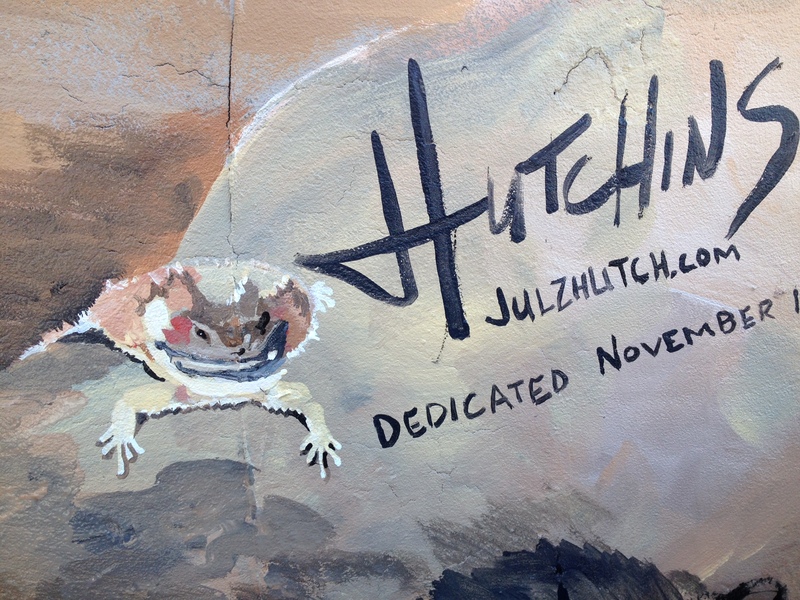 This was some special stucco which was donated by Seneca Design Materials group, out of Phoenix which cures in a day. I was so happy when these guys got this done! I went from grouchy they weren’t there yet in the morning to crazy elated when they got here and did such a good job! Patience is sometimes not one of my virtues. But I was racing the winter weather. My brother Bill and I put on the special super high quality primer the next morning, donated by Sherman Williams and I got right to painting! And in this business, it’s GOOD TO BE TALL! less scaffold/ladder time! 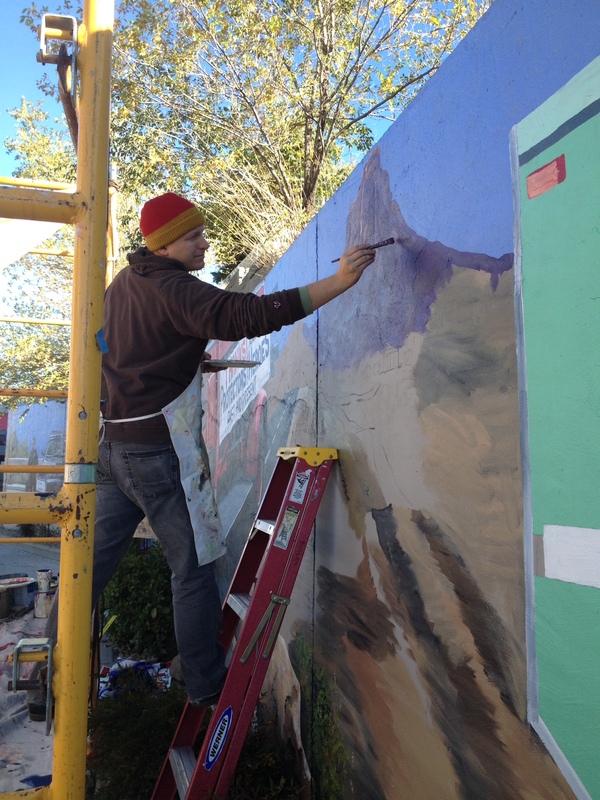 And this is my bro, Bill helping me out with the solid blue sky which pretty much stretched the whole 120′ length of the mural on the top. Juliann, one of the widows and a friend of mine and I had gone out a few days earlier to try to hike out to the Alligator Juniper tree. 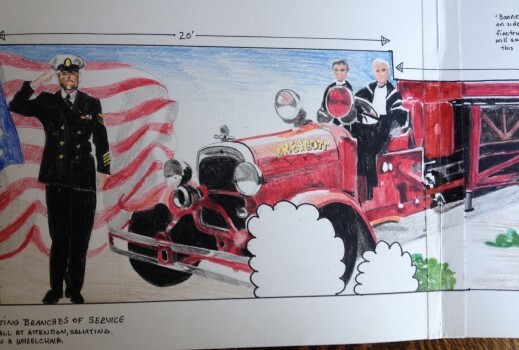 I showed her the prelim drawing which had the buggy of the Forest Service Prescott Hotshots in it. Thinking the Last Call emblem was for the GM Hotshots. I had not originally planned to put in the Granite Mountain Hotshot buggy (the city’s hotshots). I saw “the look” on her face. She told me that there was a rivalry between the 2 hotshot crews. Sometimes friendly, sometimes not so much, especially when the GM Hotshots started (on a shoestring budget). It was kind of like an ASU/UofA rivalry thing. They were all loving the same job, but they were rivals. Although, she said, they also worked side by side a lot. Many of them were also friends with each other. So first we thought of putting both buggies, head to head, like haaah! But then I thought no, one will give to the other. So I made them one straight on and one turned. In the Forest Service green Hotshot buggy, I had people, the team co- captains Danny and Alana standing by and sitting in the buggy. The other buggy, the Granite Mountain Hot Shots (the ones who perished), I showed a path which they had taken, originating from the buggy and crossing the last call emblem (symbolizing their earthly death) and over to the Alligator Juniper Tree Of Life, up playing in their tree. I love to tell a story. Anyway, if you go to Arbys across the street and go through the drive thru line at sunset, the Granite Mountain buggy GLOWS. It’s pretty cool. Sweet Distraction #3: My husband Ken is a locomotive engineer for BNSF. 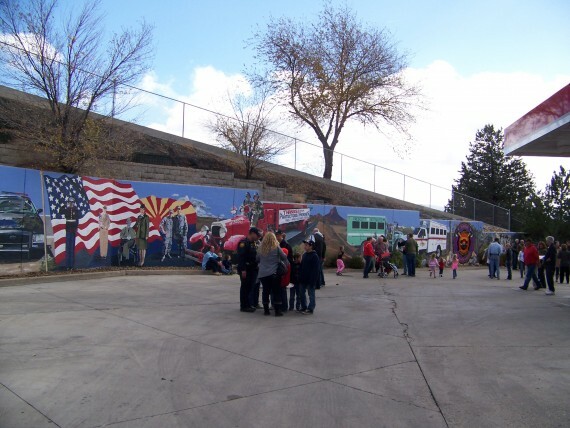 14 years ago, he started a passenger train for Make A Wish kids and kids from the AZ burn center, Phx Children’s Hospital and other children’s charities.We did this train, taking 2 days off, in the middle of me doing this mural. 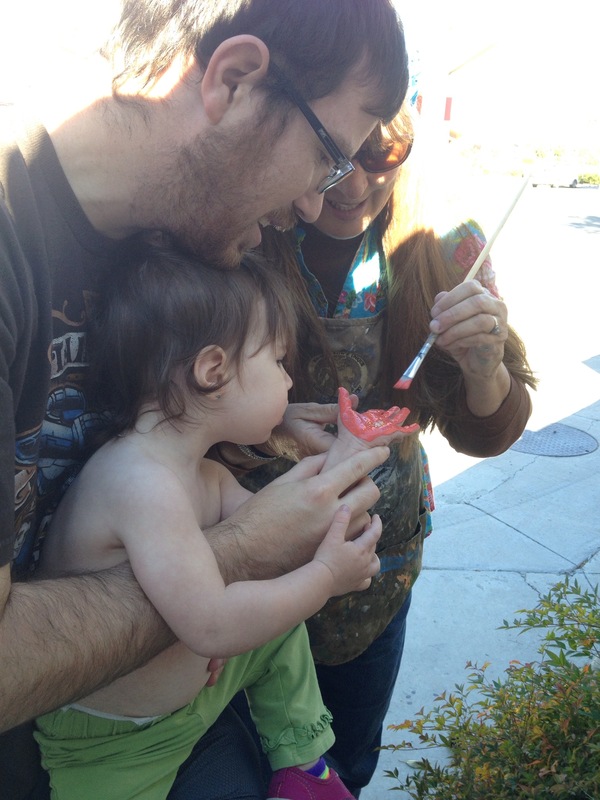 My good buddy Jen and I did face painting for the kids which is tons of fun! We even had the famous Clyde Score, who I painted a cool guitar for that you can read all about on this site, singing to the children on the train! I’ve been taking care of my mom for the last couple of years, doing only smaller and fairly local murals during this time. My awesome brother and our friend Carol took over for me taking care of her. Thank you mom for putting up with this (I know I”m your favorite!). I could not have done this without help of a lot of people! 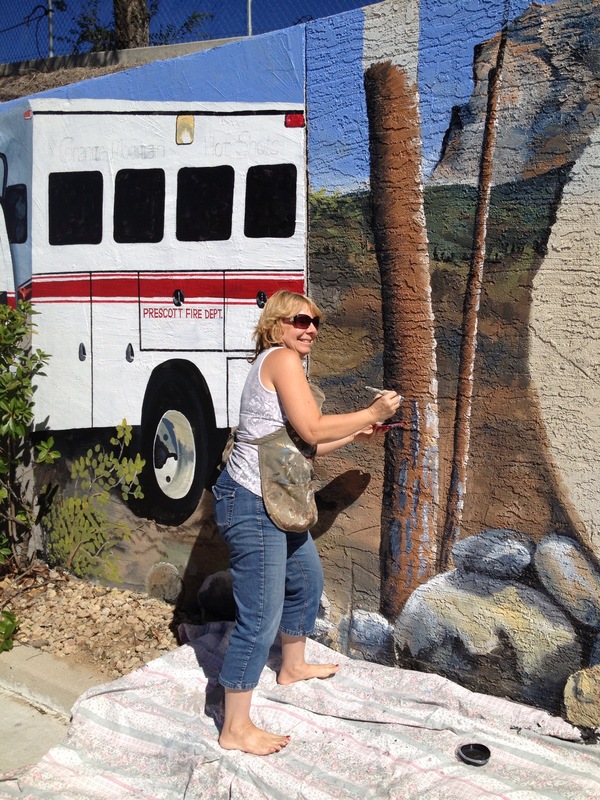 To help me out on the actual mural, first came Joanne. She told me she at first just came up to say “cool”, but saw what a huge job I had and asked if I needed help. I never turn down help! 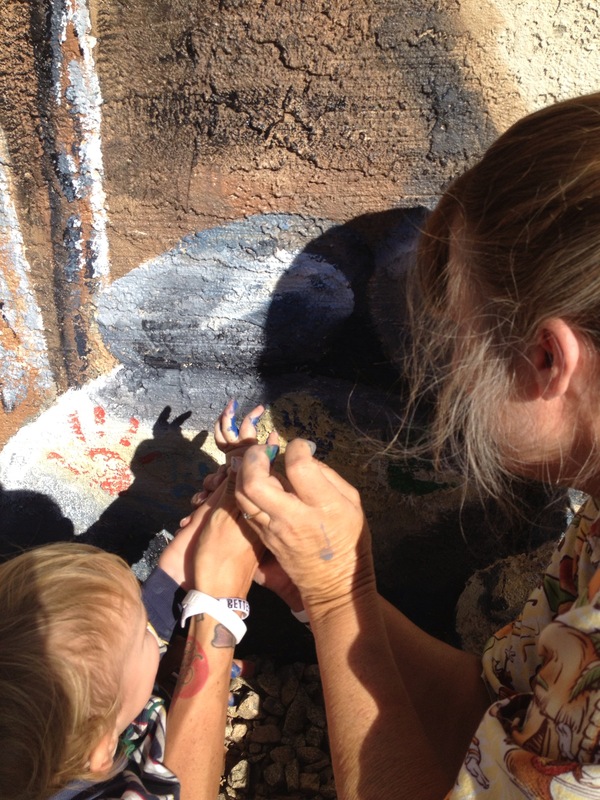 She ended up coming pretty regularly, painting rocks and plants, part of the police officer and such. Cindy turning Birch into Pine! Then came Cindy. She did the trees. I’d just come off a mural in Flagstaff where I painted a lot of birch trees. When I started painting the trees around the last call emblem, I knee-jerked painted birch trees, which we don’t have here. We have ponderosa pines. She turned my birches into pines. And she did a great job! There was one more wonderful woman, Karla, who I will cover a little later…but next came Andrew Bosley. Andrew is a friend of mine who used to paint murals back several years ago. He does other artistic computer stuff now, but I saw his website and it was pretty awesome. 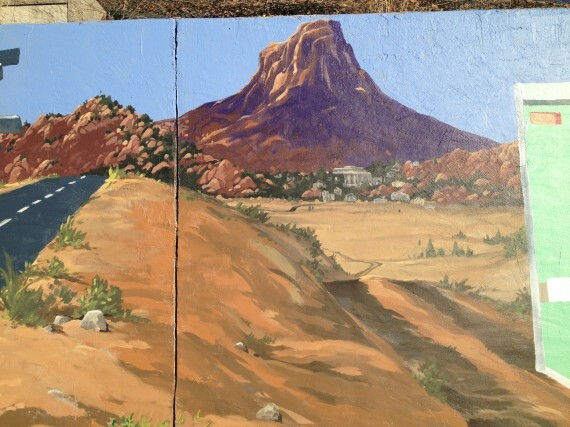 I was having angst at the thought of painting Thumb Butte, the iconic Prescott mountain. I had some photos of it that I think Cindy took. 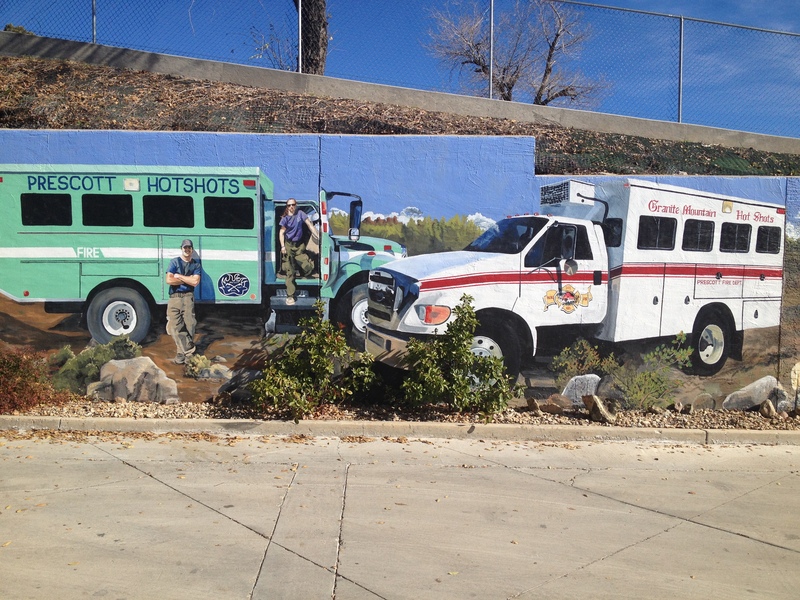 I was so into painting the people and trucks and everything, but not super excited about Thumb Butte, even though it was the center, and a main focal point of the mural. It needed to be done right. And Andrew was just the person to do it. He had to work it around his regular work, but he got it done and it’s beautiful! I watched how he did it…a little different from how I would have tackled it, and learned some cool stuff from him about light and blocking stuff in simple first, then getting into more of the detail. I tried it on a couple of the people and it worked! Thanks Andrew! Next is Prescott’s first ladder truck. This truck has a cool history. We got it in the 1920’s and it was still in service when I moved to Prescott in 1971! It was used as a backup by then, but it was still used. When it was retired, the city sold it to the antique auto club here for $1, and they completely restored it! Just before I started this mural I saw it tooling down the street near my home and it was beautiful! I screeched to a stop and flipped a youie and chased it down and stopped them. They were nice enough to pose it for me in the light I like. It was a beautiful cloudy day so it had some nice reflections on it. Later, I found the perfect pair to be in it’s seats. 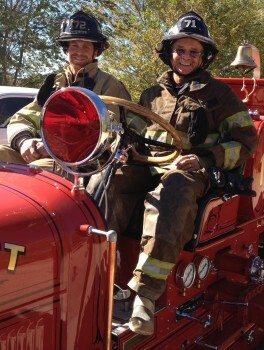 The father, Tim, used to drive this truck back in the day and his son Travis is a current firefighter. I loved their faces! Check out this pic of them and then my rendition of them. Pretty cool. 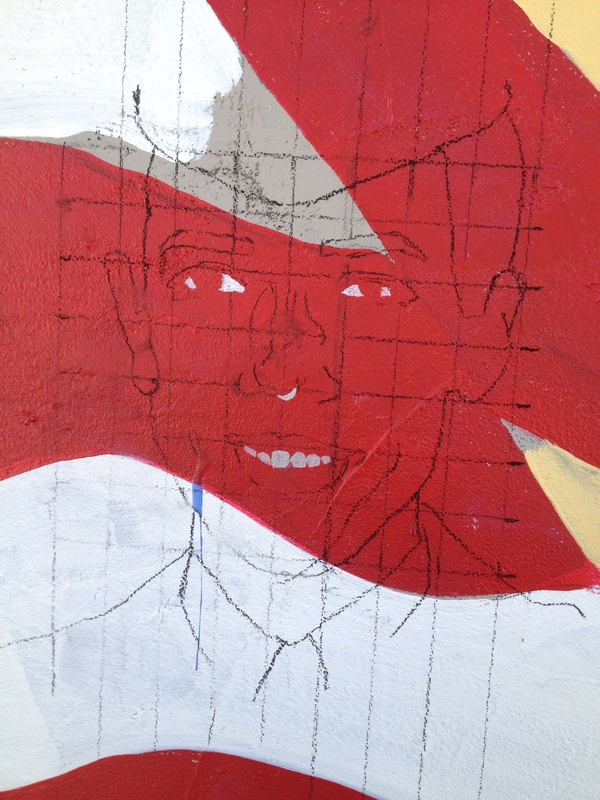 When I have a great face/photo, the painting is guaranteed to come out good. This is part of why I always like to take my own photos. 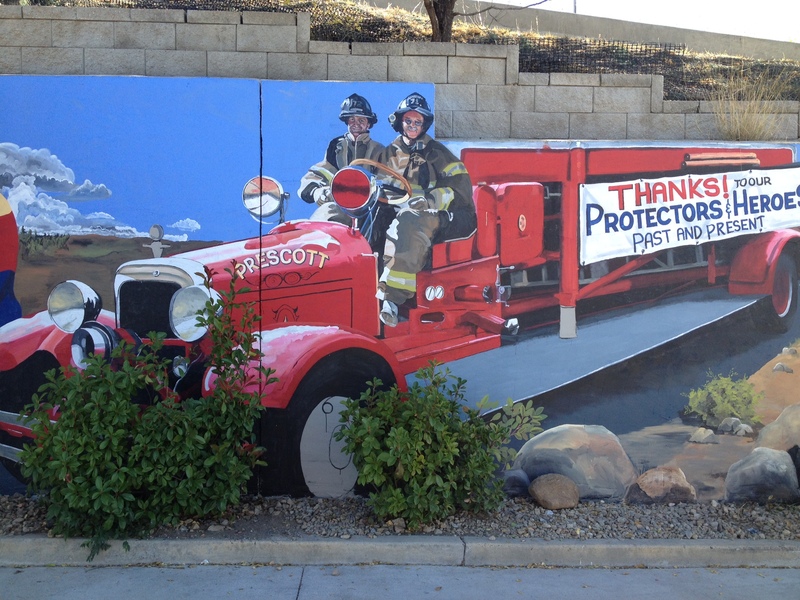 On the firetruck is a banner which says ” Thanks to our Heroes and Protectors and their Families”. As soon as I’d gotten the previous hotshot buggies blocked in, I did the banner so folks would understand this is not just about the hotshots, but ALL of those who risk all to preserve our lives, property and liberty. For quite a while only the blocked in truck and the finished banner were painted while I ran around painting other stuff, getting the entire mural blocked in. Next were my vets. I love my vets. I have 2 kids who are vets and I used to work at the VA hospital as a nurse and I just loved those guys (and occasional gals!). 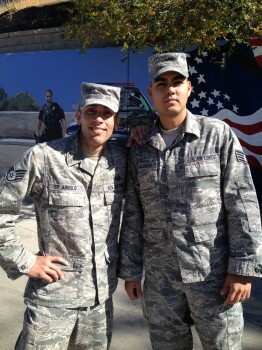 The first 2 are my Air Force guys, Roberto and I didn’t get the other guys’ name. 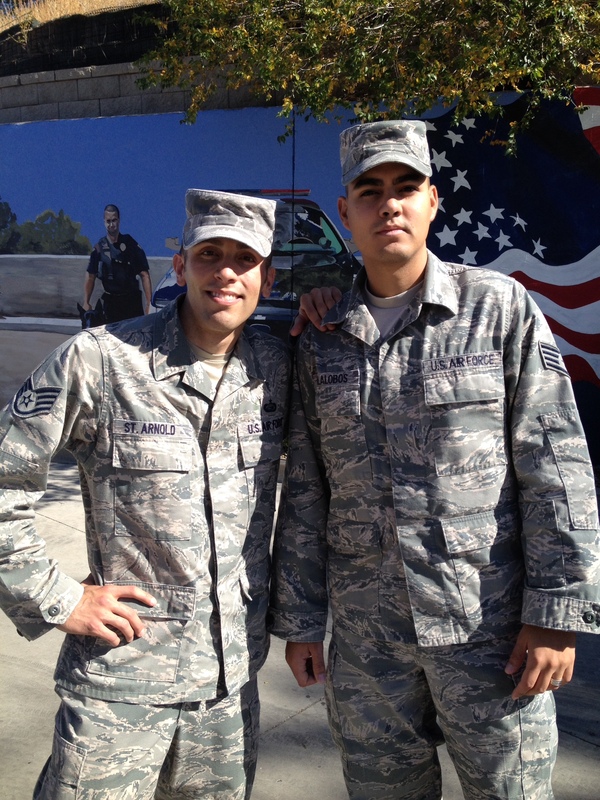 They are active duty out at Embry Riddle and came in to get their car washed. 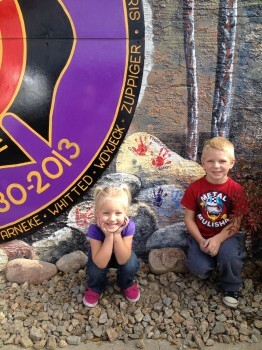 They jumped out of their cars and were jumping around amazed at the mural. They were so awesome! I’d originally planned to paint only one from each branch of the service, and they were all going to be in their dress blues and saluting. Very formal. But these guys epitomized the comradary of the military. They were in their combat fatigues, but I figured what the heck. I got their pic in the perfect sunlight, and as I said before, the quality of the painting is usually pretty dependent on the quality, for me, of the resource. Next comes my Army folks. Once again, one was planned as in the painting above, but the second had such a great story, plus he represented our wounded warriors. I added him in later. The female is Laurie, my #2 daughter (hey, a little nepotism doesn’t hurt!) who was in the Army during the 9-11 era in the Middle East. I needed to get her face accurate so I gridded her out. 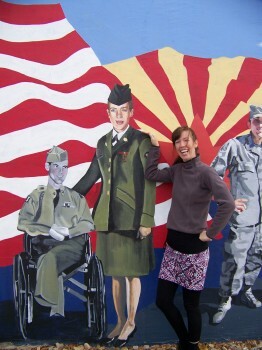 She is coupled (in the final vets image below) with a local hero PFC Ed Reeves who is now deceased. He was in Korea where – it’s a long, courageous story – but the end result was he lost his legs below the knees to shrapnel and his fingers to the frostbite he endured. He came home and married a beautiful woman and had 7 wonderful children, leaving an amazing legacy. The picture I got from his widow was in black and white, plus I got another of just his face which was “colorized”. I thought of fleshing out the color and making it like the rest of the vets, but thought it would be a nice contrast to show the different eras using the black and white photography of the time. The next guy is my friend Roger who is a Vietnam Vet who was in the marines. He’s a really tall dude so he made a good person to put on the end, to sort of frame the flags and other vets. I chose for my vets, not people who have roads and airports and stuff named after them. 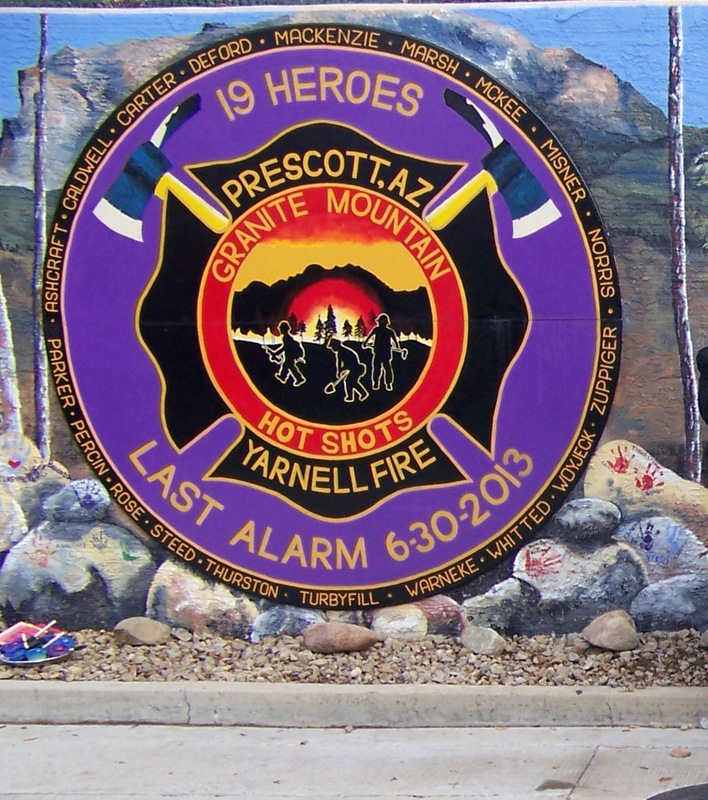 They are the regular rank and file folks who protected us with honor, with strong ties to Prescott. 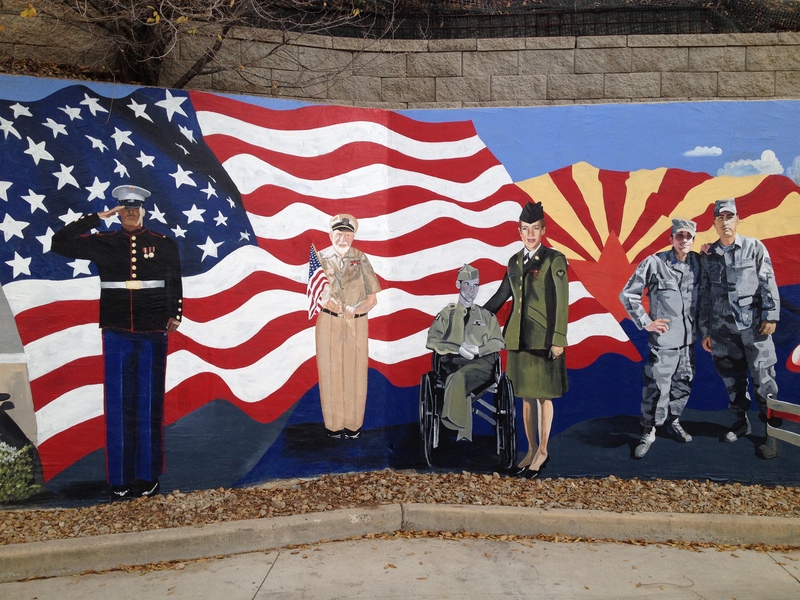 In fact all of the people represented in this mural are just the regular folks who protect us. Our unsung heroes who we are now singing about. 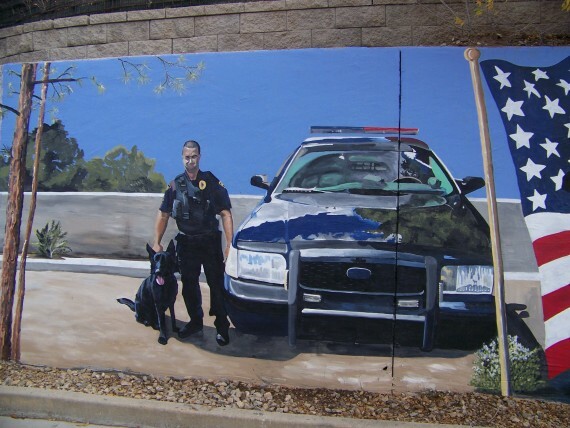 On the end of the mural is our police officer. I really like dogs, so a Canine Unit was a perfect choice! 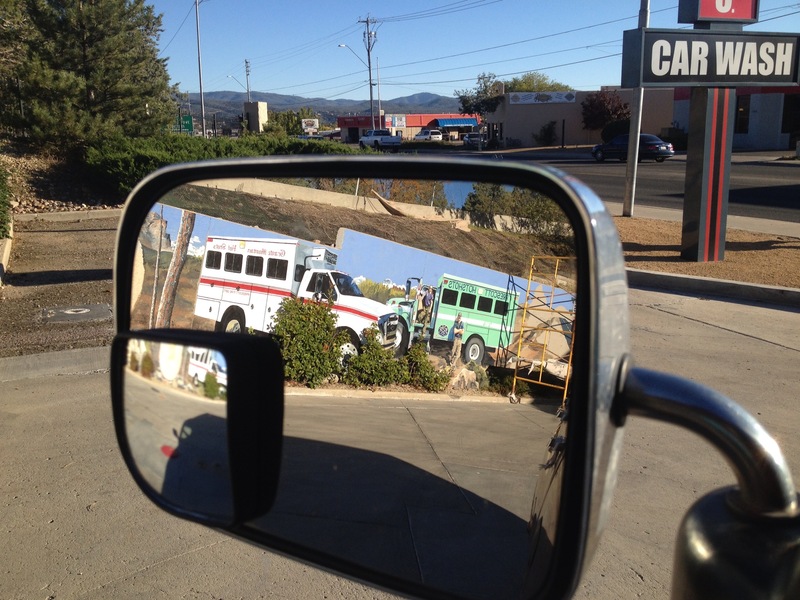 I love it when dogs in cars come through the car wash and start barking their brains out at the “dog” on the wall! This is Officer Smith and his canine companion Corey. once again a rank and file guy. I really liked this officer. He’s actually a lot more handsome than in this painting, but his buddies talked me into leaving him squinting! When I was taking the pictures out in front of the police station, I was hoping they would bring out a really cool vehicle. But instead they brought out an ugly, plain black car. Rats. But I placed it under a tree, and it was a cloudy day that day, so when I took the pic I realized that car was as painted, anything but black! But put it all together and the mind sees a black patrol car. 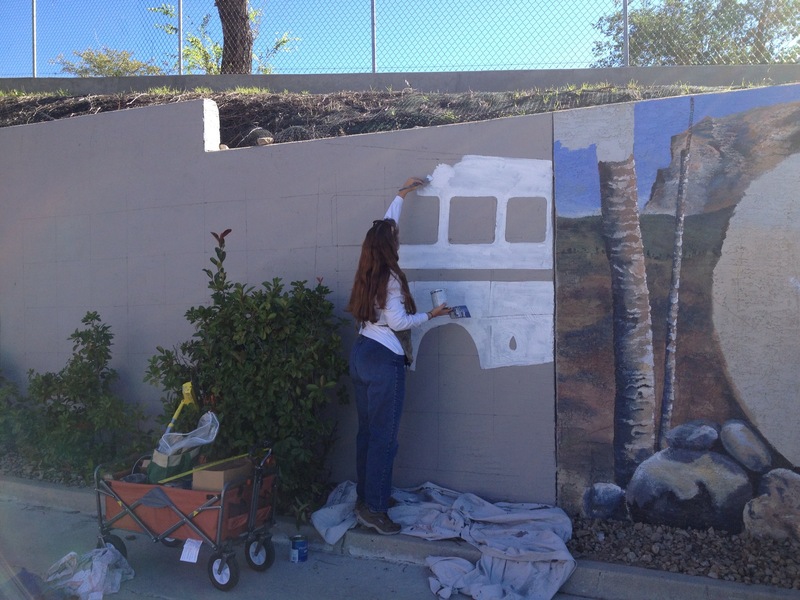 It was at least as good as the other classic vehicles in the mural! We had the mural dedication November 16th. It was pretty cool. We had maybe 120 people there, live music, barbecue, bagpipes, dignitaries, the mayor gave me a coin thing that was the seal to the city for service which was kinda cool. It was a huge honor to paint this mural. 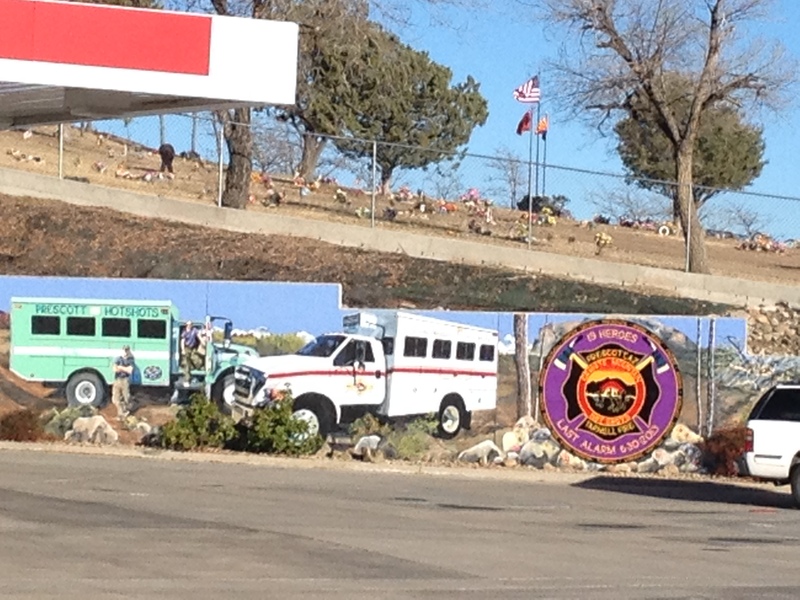 I love driving by it today, after our dedication, seeing people in front of it, studying it and being moved by it. I left my web address by my signature in which folks are able to contact me. I’ve received some really nice comments from them. And oh, my signature…almost forgot! And of course it has my famous lizard in it by my signature. And it was a lizard (horn toad) saved by the hotshots. Pretty cool! 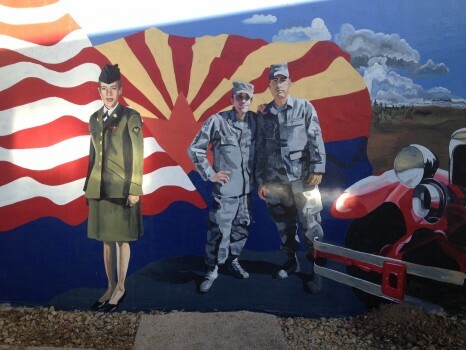 The Prescott Courier did an article about this mural. You can read it Here.